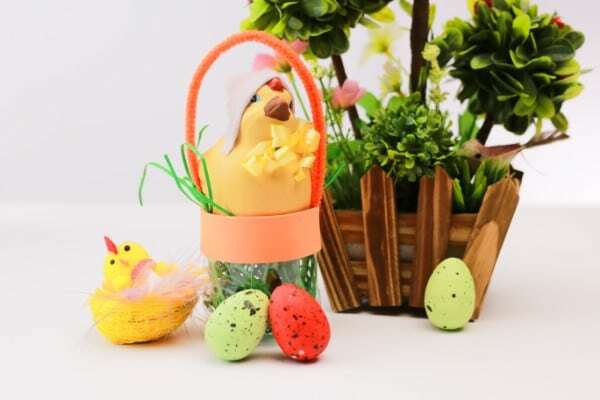 Easter is an exciting holiday every year, and Easter crafts provide you with a great way to welcome in the spring season and celebrate new life. I hope you enjoy these easy, affordable, and creative projects with your children! Let us know your favorites in the comments below, and be sure to link out to your own projects with your kids! Can you believe that springtime is just around the corner? With springtime comes Easter—a celebration of baby chicks, fluffy little bunnies, and all the happiness of renewal as we head into the warmer months of the year. This is a wonderful time to do some crafts with your kids! Make Easter more fun than ever with these wonderful spring-themed projects, perfect for kids of all ages. More fun paper plate crafts. 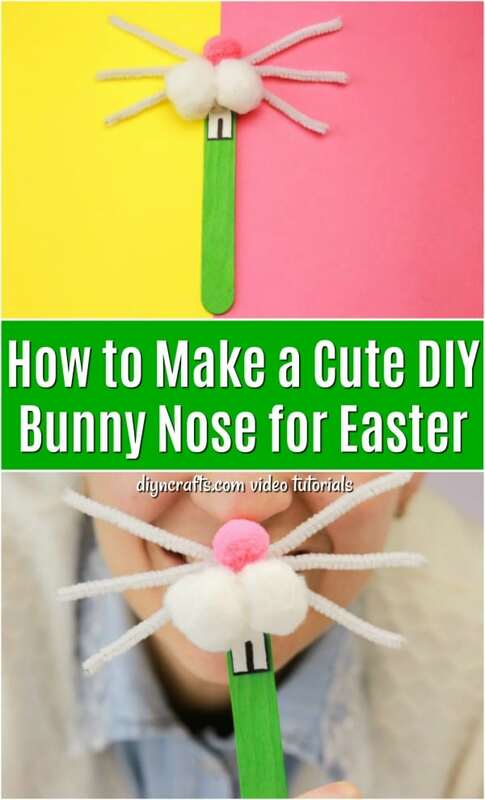 This DIY bunny nose is really going to thrill your little ones. It’s so easy to make and this is a great project for the kids to do on their own. You just need a few basic craft supplies for this one, like a popsicle stick and a few pom poms for the decorations. Once it’s done, kids will be playing with this adorable little Easter Bunny nose right up until summer! The entire project takes less than 10 minutes, and this is a great hands-on craft for toddlers and preschoolers. 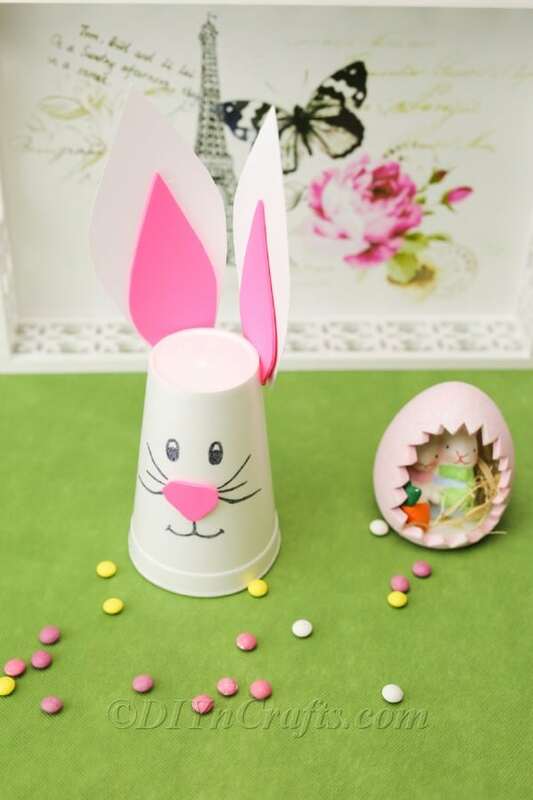 With just a Styrofoam cup, some pink craft foam and a piece or two of cardstock or heavy construction paper, you can make this adorable little Easter Bunny that your kids are going to love. This is a great craft for kids, since it’s really simple to do. And who doesn’t love an adorable Easter Bunny? This one is great for toddlers and younger children because it’s so simple. And, they can decorate their own little Easter Bunny however they want, just adding to their excitement. I love printable projects for kids’ crafts. 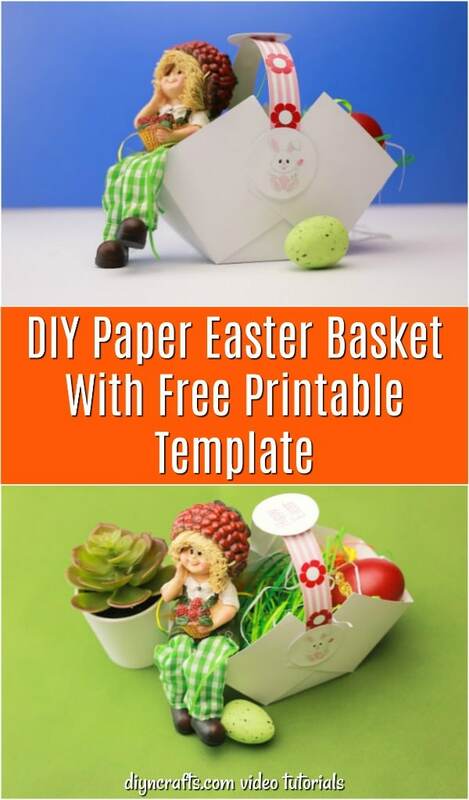 This DIY printable Easter basket is the perfect craft for older kids, or even younger ones if you help them with the cutting. You need to print off the template and older children can cut along the lines and glue this one together themselves. If you want something for toddlers and preschoolers, simply help them with the cutting and then let them glue the basket together and even decorate it with Easter grass and eggs. One sure thing about kids – they love Easter candy. 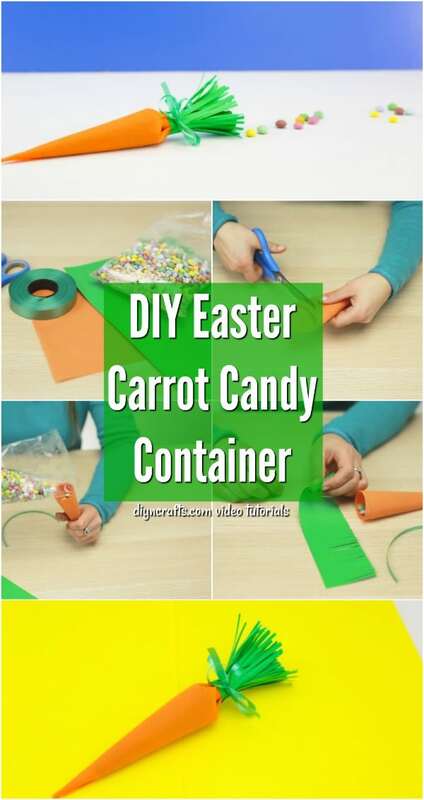 They will also love making their own little Easter candy holder with this simple Easter Bunny candy jar. 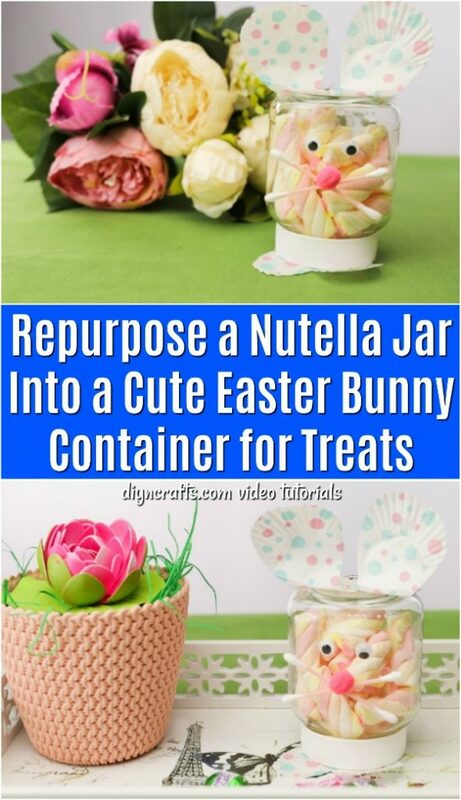 You make this from an empty Nutella jar – or any plastic jar that you have on hand. Kids will adore making the ears from candy cups and helping you to put on the pom pom nose and Q-tip whiskers. This is a great project if you are looking for something unique that the kids can make as a gift for their teacher this Easter. 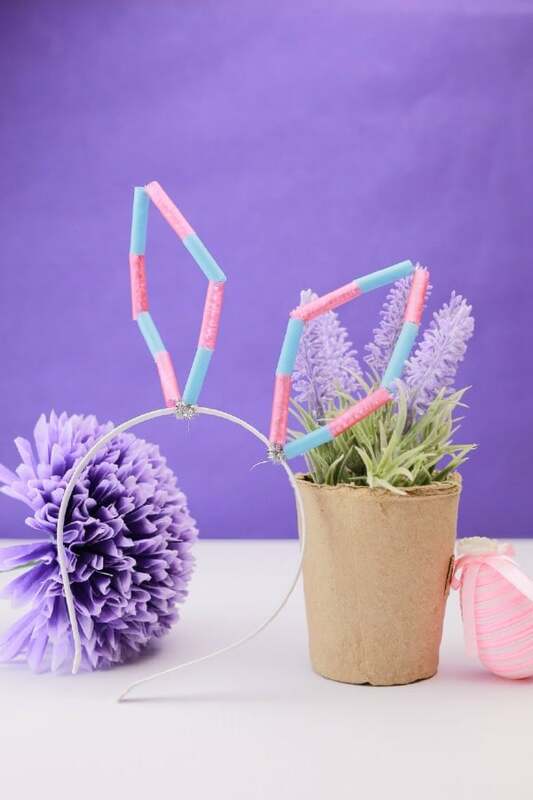 Your kids are going to absolutely adore these cute little bunny ears that you can make from colorful straws and a plastic headband. By all means, let your little ones help you with this one. It is so easy to do. You will need to cut the straws for your really younger ones and the pipe cleaners. Once you have all of the pieces ready though, toddlers and preschoolers can easily put these together, and they are going to love wearing these to all of their Easter egg hunting activities this year. After you make your Easter eggs this year, the fun isn’t over! 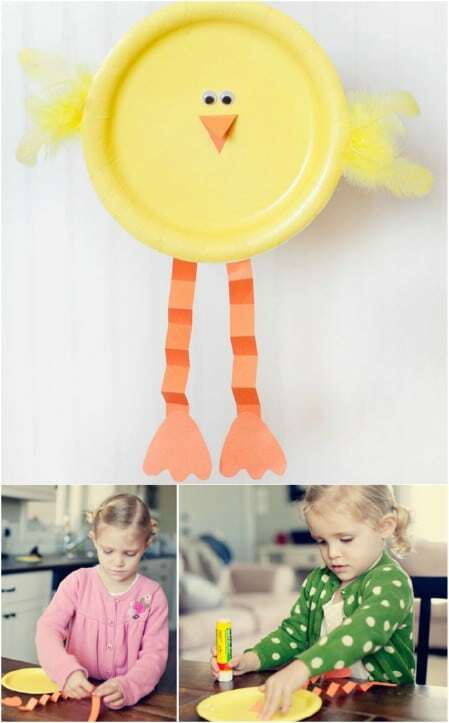 This fun project allows you to transform your leftover egg carton into adorable little yellow chicks with cute beaks, wings and feet. The chicks double as containers which open and close, which you can use to store candy or whatever else you want. Supplies are really basic—just the leftover egg carton, some yellow paint, a black marker, and some yellow and orange card stock, scissors and glue. Just check out the tutorial at the link and follow along. Here is the perfect craft for you to do with your toddlers or preschoolers. 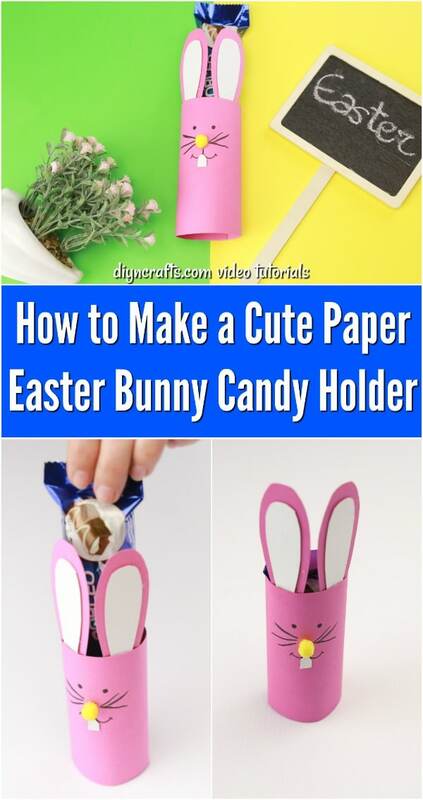 You just need a wooden clothespin and a few basic craft supplies, and your little one can make his or her own little Easter Bunny. These are almost too cute when they’re done, and it only takes about 10 minutes to make one. 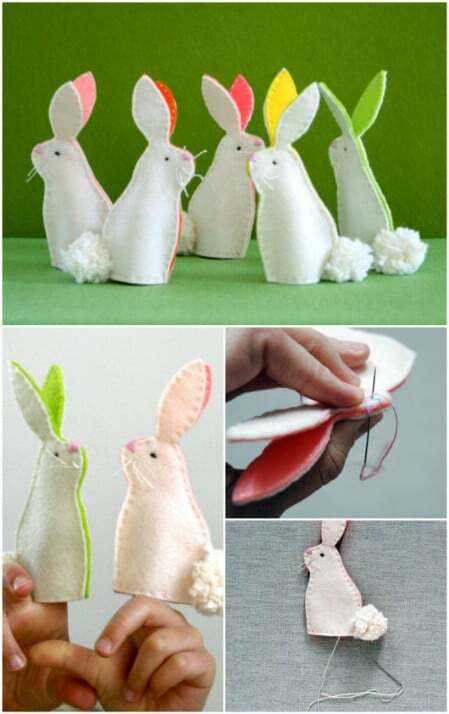 Little ones are going to adore making their own bunnies that they can use to decorate their rooms for Easter. Seriously, it is amazing what you can do with some paper, fabric, and other basic sewing and craft supplies! Looking at these adorable bunnies, I almost wouldn’t guess that they are simply repurposed toilet paper rolls, but underneath that cute polka-dot fabric, that’s exactly what they are. This is a project which is really easy to customize; you can choose any fabric you want for the bodies, noses and ears. It just does not get any cuter than this. The tutorial is in Spanish, but if you hit “translate” on your browser, the instructions are easy to follow in English as well. 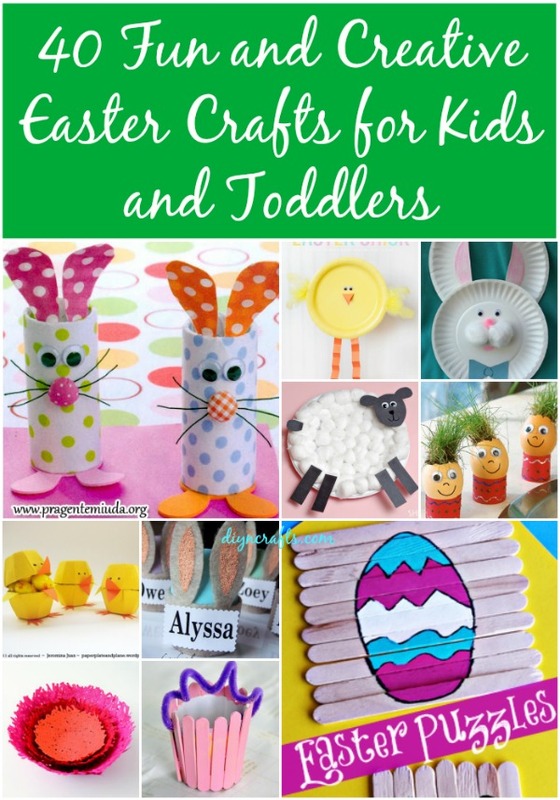 Are the little ones driving you crazy wanting a new Easter craft project? This DIY repurposed bottle Easter basket is the perfect way to keep them busy. These little baskets are really easy to make and this is a craft that is perfect for kids of all ages. Cutting should be done with supervision for smaller children but kindergartners and above could probably make this one all on their own. Plus, these little baskets are really cute when they are finished. When I was a kid, I loved paper plate crafts, so when I saw these, I knew that I would have to share them with you. 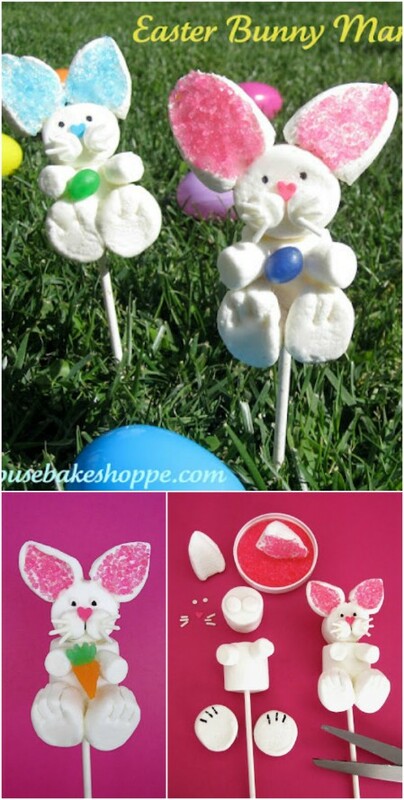 If you are looking for fun Easter crafts for kids, particularly younger kids, then these are perfect. 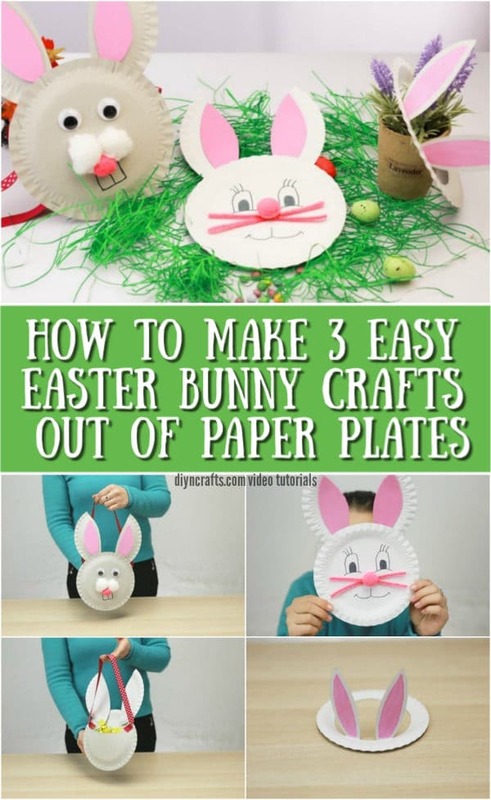 You can choose from these cute stand-up bunny ears, a bunny face or an Easter Bunny basket that is made from paper plates and some colorful Easter ribbon. Your little ones are going to adore making all of these, and since paper plates are really cheap, you’ll love them too. 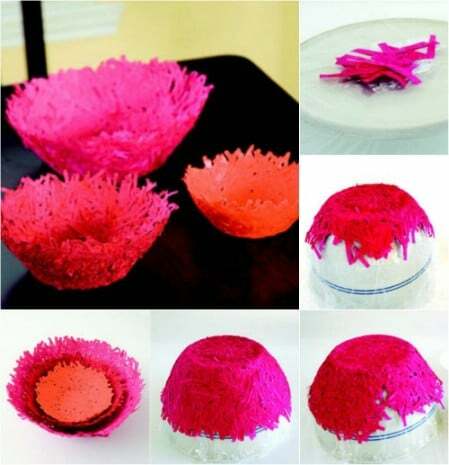 These bowls are incredibly cool, and would make a great activity for anyone, whether you have kids or not! They are easy to make, but definitely produce a really artistic effect. They’d look great sitting on any table or shelf, and you might very well decide to keep them out and use them through the rest of the year. I imagine there are a lot of ways you could subtly modify this project with different colors or sizes of paper strips or even arrangements of strips. A very colorful and fun project that children or grown-ups can enjoy. 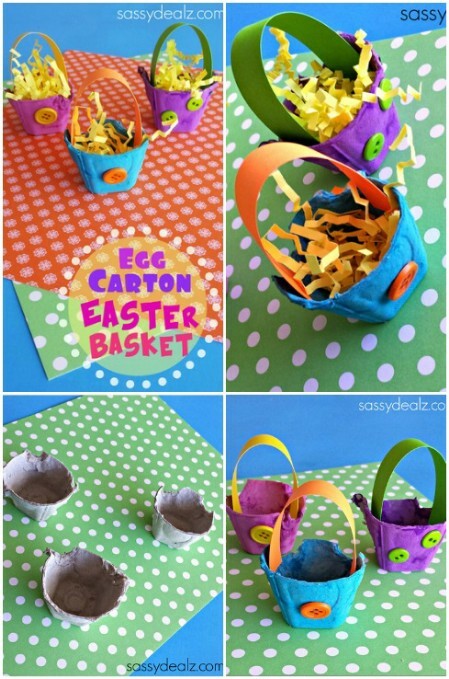 These little Easter baskets are fun and easy to make. They do require some supplies you may need to go out and buy like mini wood craft sticks, acrylic paint jars, and fuzzy sticks, but everything you need is cheap and easy to come by. The detailed tutorial will teach you how to make these baskets and paint them step-by-step. A perfect activity for small children. If you want a project to keep the kids busy and something that they are going to adore making, these little carrot-shaped candy holders are perfect. Kids love getting candy in these and my kids loved making them, as well. They’re not terribly difficult to create, even for toddlers. You just have to help them with any cutting and shaping. Older kids will be able to do these all on their own, and they make the perfect way for your little ones to share some candy with their friends this Easter. 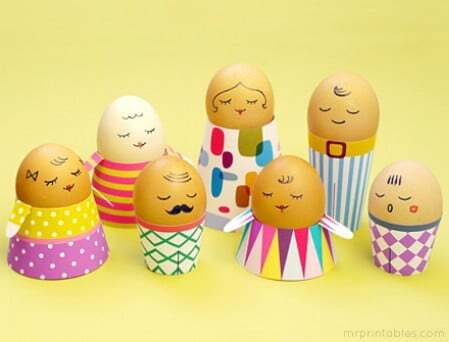 These eggs are a fun alternative to the plastic Easter eggs you buy at the store! While they are fragile and can easily break open (by pulling on a string), they also are durable in their own way and can hold quite a lot of candy. You will probably be surprised at how heavy you can make them. Just like a real egg, you have to break them open to get at what’s inside. So they add fun to Easter in two ways; they give you something fun to create with your kids, and you kids will also have fun breaking them later to get at the candy. The actual process of creating them is itself pretty entertaining, and involves water balloons! As a cute bonus, hide some little chicks inside a few of the eggs and surprise your children with them. Have an old wooden spoon around that you no longer need? One great use for a wooden spoon outside the kitchen is in the craft room. This is a very easy project which is ideal for toddlers and other young children. The only supplies you need are the spoon, some yellow paint, orange craft foam, yellow feathers, eyes and glue. The concept is every bit as simple as you are probably guessing. The tutorial is very quick. This project is great for kids with a short attention span who may not be able to handle something more complex with more involved steps. It’s a fun toy to play with after it dries, and if you have more wooden spoons around, you can create other farm animals for the chick puppet to play with! 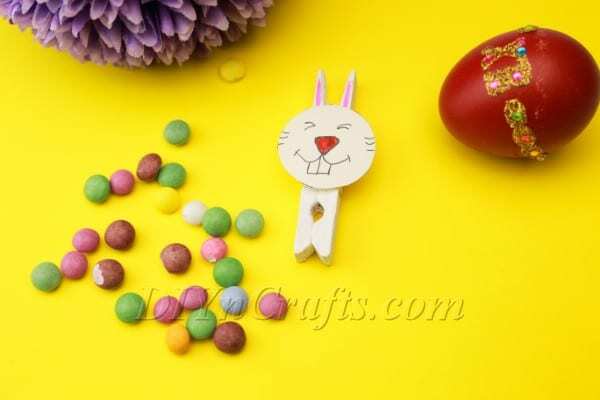 Kids are going to love making these little Easter Bunnies for their candy, or just for decoration. 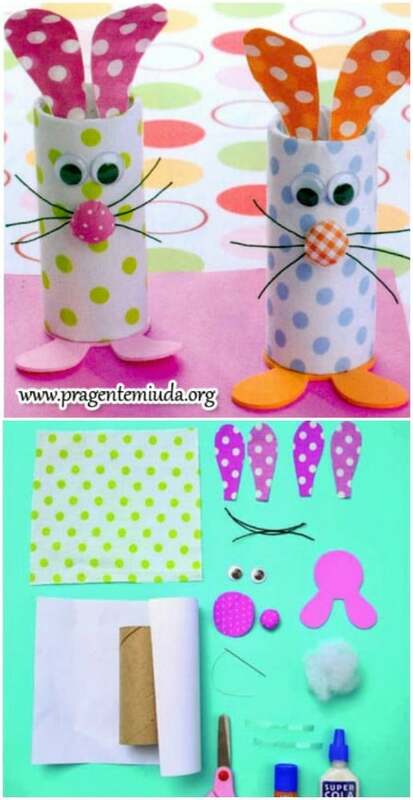 This is a great project for toddlers and preschoolers, and these little bunnies only take a few supplies and a couple of minutes to make. 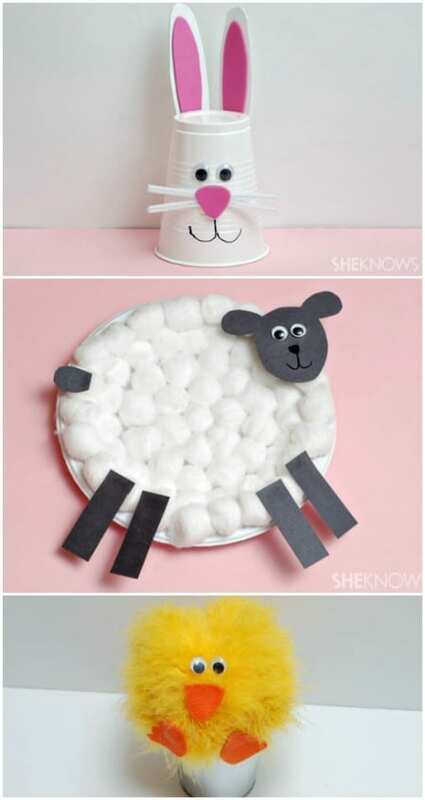 Little ones are going to adore making these little Easter sheep out of paper plates. This is a great holiday project for toddlers and preschoolers – or older kids. These take about 15 minutes to make, and you only need a handful of supplies to create them. 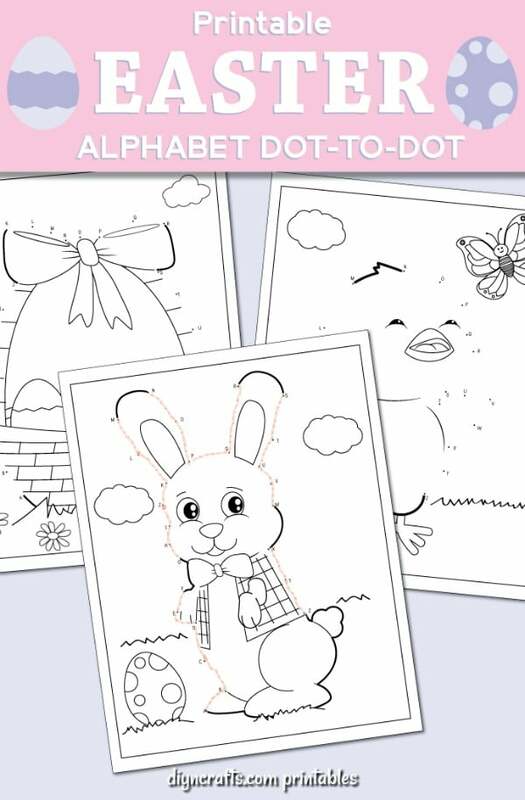 If you need something to keep the little ones busy while you’re preparing Easter dinner, these dot-to-dot activity pages are perfect. Kids love doing these activities and once they connect the dots, they can color in the pages and use them for decorations. 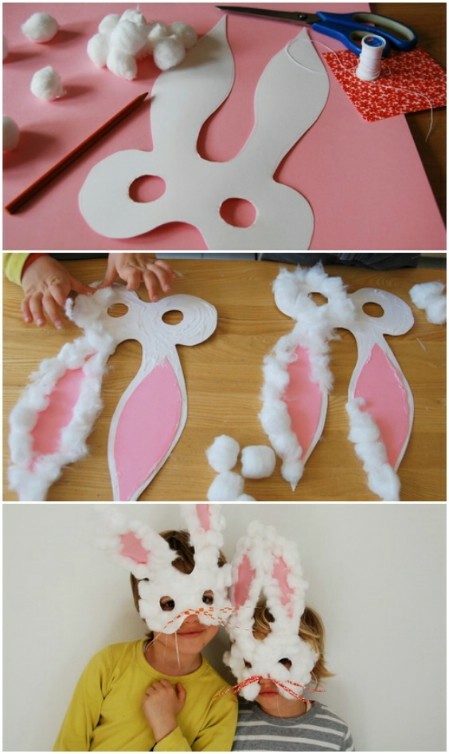 This cardboard Easter bunny is the perfect craft for toddlers and preschoolers. 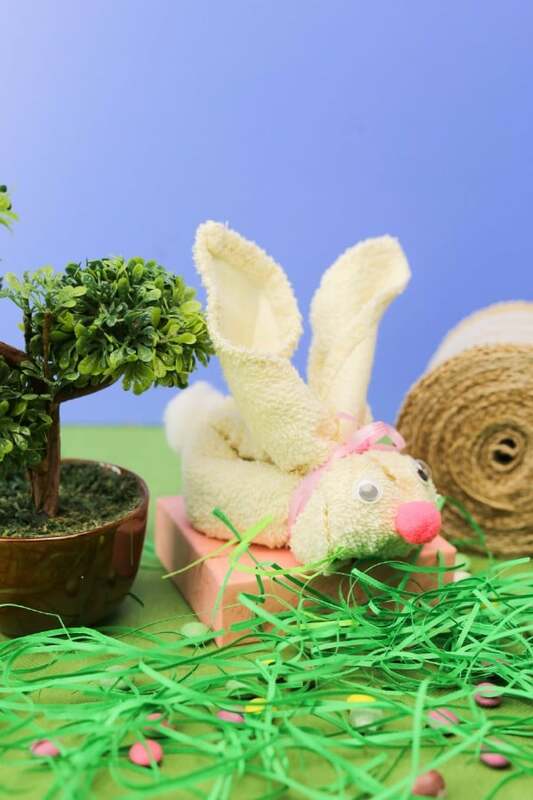 Using recycled cardboard, you can help your little ones to create this adorable Easter Bunny that takes only minutes to finish and is the perfect kids’ craft for the upcoming holiday. 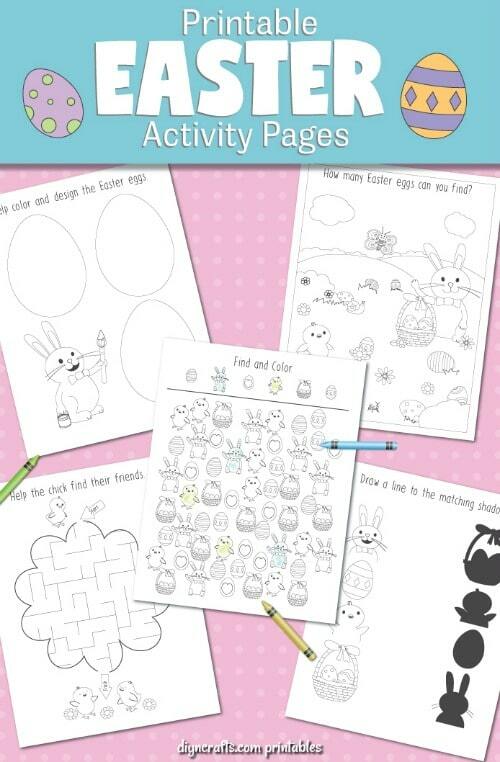 These Free printable activity pages have so many fun Easter things for your toddlers and preschoolers to do. From coloring pages to matching, your little ones will adore these activity pages that you can print straight from your computer in just a couple of minutes. 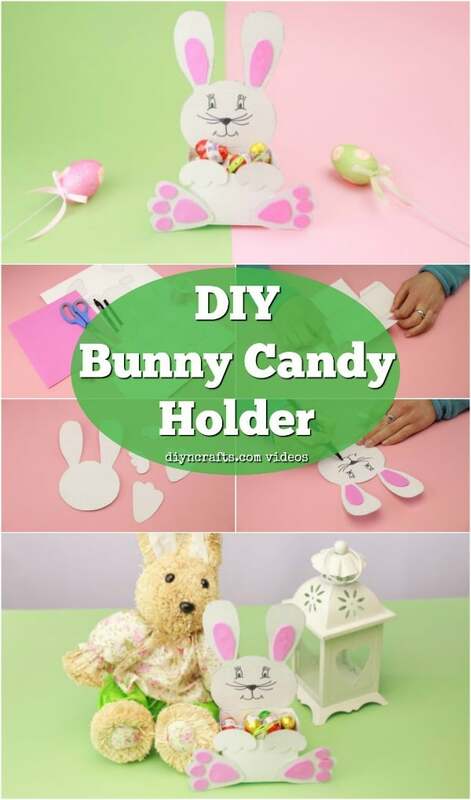 This super easy candy holder looks like the Easter Bunny himself, and this is a fun craft project for kids. You can help younger ones to print off and cut out the template pieces, and then let them put the candy holder together. Toddlers and preschoolers are going to love making these cute little decorated Easter eggs. You just need a few basic craft supplies to turn ordinary eggs into these cute Easter Bunnies, and this is a great project for little hands! My kids used to make these adorable little Easter Bunnies when they were little. They made them in school, and they would bring them home with a little plastic egg inside. These are perfect for decorations and they hold a plastic egg, which you can fill with candy if you want to give these little repurposed towel Easter Bunnies away as gifts. You can use any small towel – like a kitchen or hand towel – or a washcloth if you want to make it a bit smaller. This is a great craft for even your toddlers to do. This is an adorable project without a step-by-step tutorial, but judging from the simplicity of the toy, it would be quite easy to figure out how to make these from scratch. For children who want to learn some basic sewing, they would make a fun activity—not bad for the grown-up who loves to sew either. Just look at those cute fluffy little tails! This is another project you could easily do variations on. Get some yellow fabric and add on little beaks and you could easily make chick bean bags too. These are a blast to play with too! They’re so cute and probably so addicting to make that you shouldn’t be surprised if they multiply like … well, bunnies. Looking for a really easy craft you can do with a toddler? 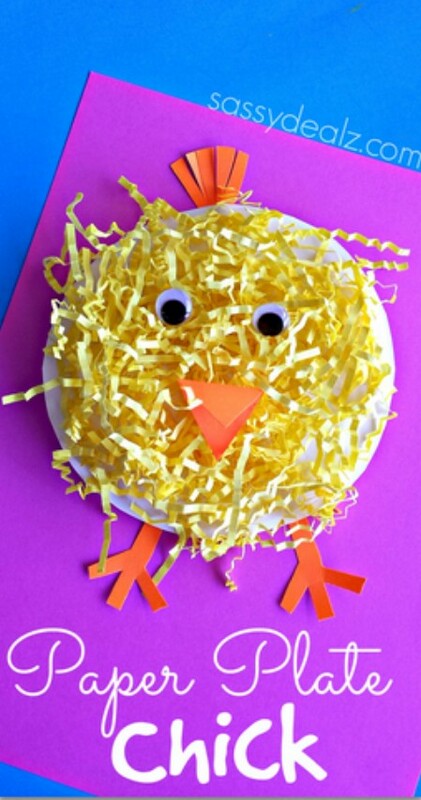 It’s hard to get simpler than this Easter chick made using a paper plate, paper legs, paper beak, and feathers glued on (and cute little eyes of course). These are actually pretty amazing. It turns out the shape of an egg carton actually lends quite naturally to the neck, head, and wings of a hen, if you cut it the right way. Not only that, but the egg carton texture actually adds a nice touch—it gives the same effect as feathery down! You can use the scraps left over from the carton to create the beaks and crests. Then just decorate an egg and stick it between the wings. These really look quite sophisticated, considering how simple their construction is. All you need is the carton, the eggs, and some paint and glue and scissors. Awesome craft! There are several great tutorials all on one page here. The top one for the feathery chick craft is my favorite. Just look at that adorable ball of fluff. 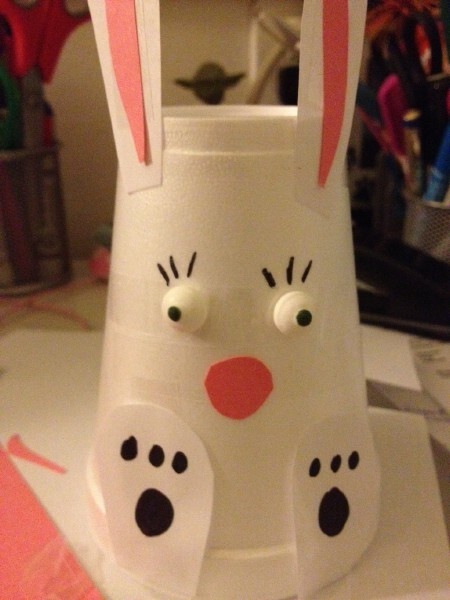 Scroll down and you’ll see another craft idea for a bunny made out of a plastic cup. 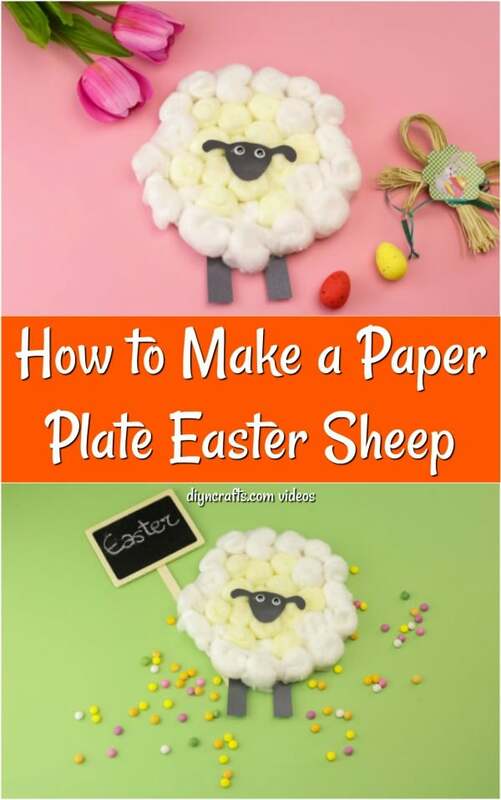 At the bottom of the page, you’ll find an idea for a sheep made out of a paper plate, some cotton balls, and construction paper. All of these projects are perfect even for really young children. You can do all three, or let your kids pick and choose the ones they want to do. You probably have a lot of the supplies on hand for them already. Here is another project you can do with the help of water balloons. Once again, you will be using them as a mold to help your project set while it dries. Quite simply, you blow up the balloons until they are the right size and shape for an egg, then you coat your yarn in glue and paste it on. At the end, you simply deflate the balloons and remove them. The result is a super cool see-through egg in whatever color of yarn you choose. You can use a lot of yarn for an opaque, more “finished” look, or keep them light and open like the eggs in the tutorial. They have a nice modern-art vibe and would fit great with any Easter décor. This project is wonderful for children or adults! Here’s yet another paper plate craft to keep your kids busy! Have a lot of extra Easter grass? Usually when you buy that stuff, you get a lot more of it than you are actually going to put in your kids’ Easter baskets. Here’s something you can do with the excess. With leftover yellow Easter grass, you can make a chicken out of a paper plate, with the grass standing in for the feathers. Oops, didn’t buy yellow grass? If you bought white grass, you could make a bunny or a sheep instead. This is yet another project that is easy to adapt. 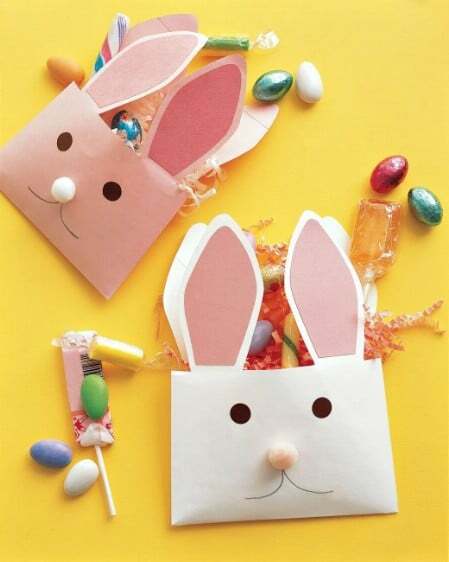 Envelope bunnies not only make a great activity for Easter, but they are also great for giving as little gifts. Children can take these to school and present them to their friends as a fun surprise. While instructions are included in the tutorial, I recommend glancing down at the comments as well for some extra tips. One reader recommends using legal envelopes instead of the letter-size ones for better results. 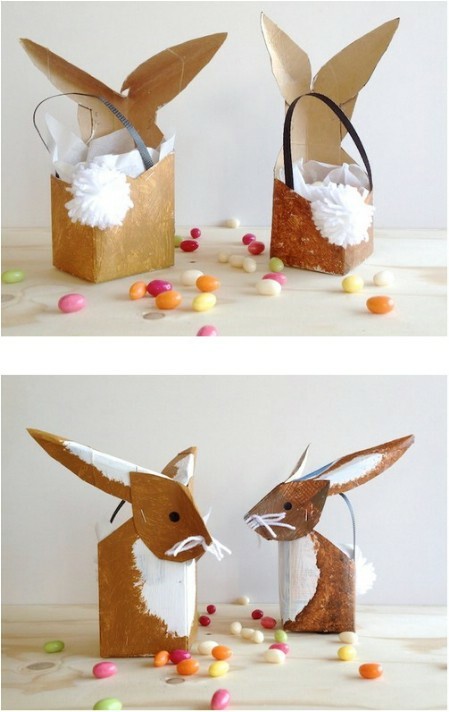 Once your envelope bunnies are finished, you can fill them with Easter grass and treats. 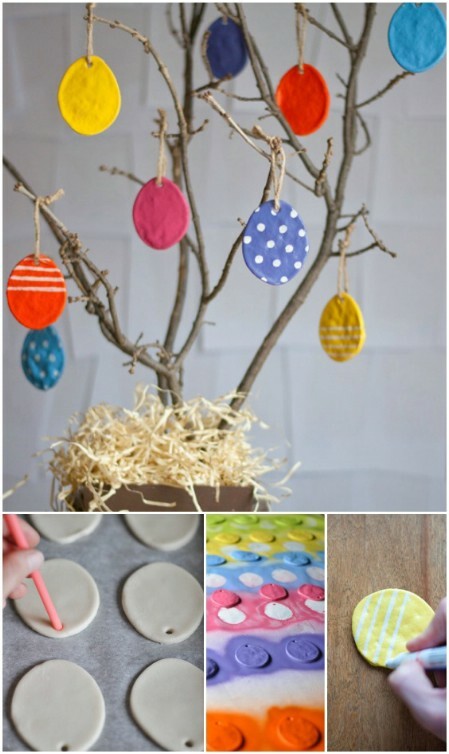 There are so many things you can do with paper plates when it’s Easter time! 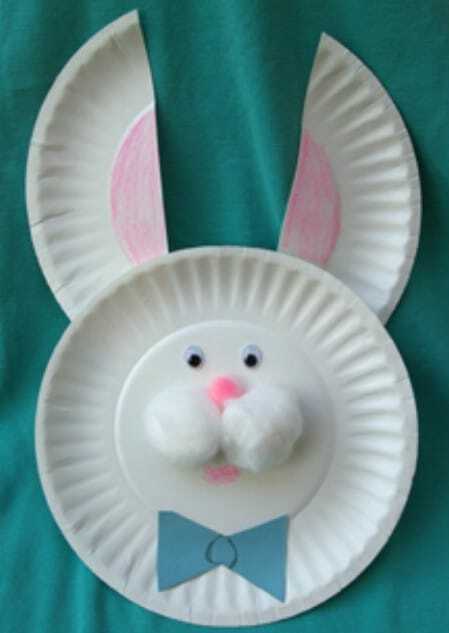 Here’s a very cute way you can make a bunny out of a couple small paper plates. The dessert-size plates are easier to work with for toddlers than the larger sizes. One plate makes the bunny’s face, and the other cut in half makes the ears. The cotton balls have a great effect for the muzzle and nose. What a wonderful project! Are you hosting an Easter party this year? Want to embellish the table a bit for the kids? 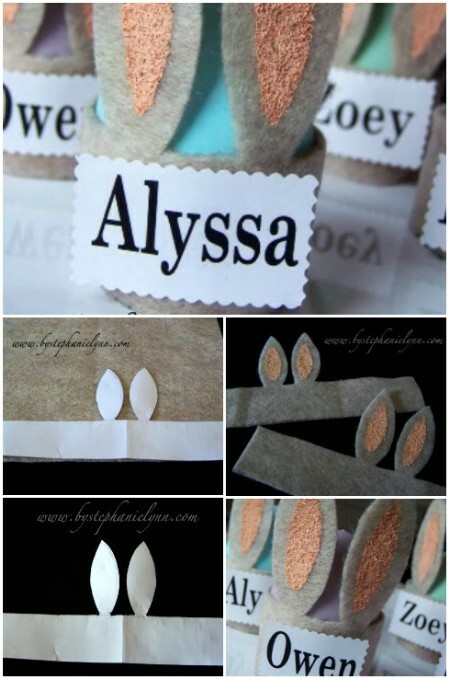 This project will teach you how you can make place cards with names and little bunny ears. They are festive and simple to make using Stephanie Lynn’s great tutorial. You can do this project on your own, or you can enlist your children’s help. Either way, you will have a fun time, and everyone will get a kick out of your cute and clever place settings! This idea comes from Crafty Morning, the same blog that gave us the tutorial for the chick plate using the yellow Easter grass. Who knew there were so many things you could do with egg cartons? 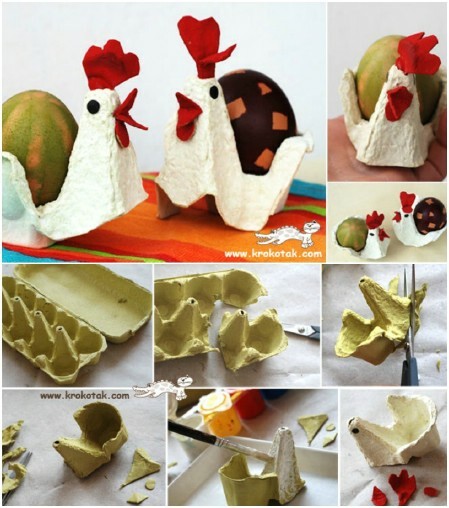 Egg cartons are just as crafty and fun as the eggs that come in them! This one is less complicated than the carton hens from earlier, since you do not need to cut the carton in any special way. You are just going to use the compartments for individual miniature Easter baskets. Painted, they look quite nice. The buttons make a great touch! You could embellish them however you wanted and come up with some really lovely alternatives too. 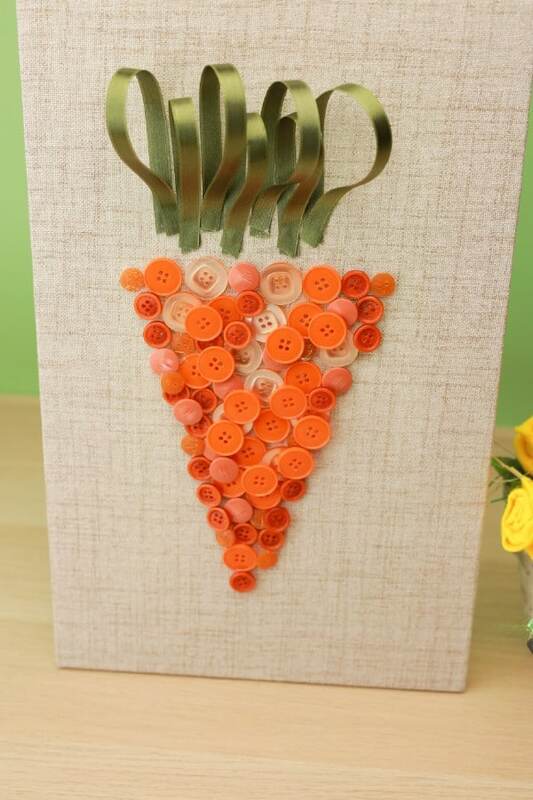 Here is a great little project for the kids this Easter – This DIY button art turns ordinary orange buttons into an adorable carrot wall art. Kids adore gluing things – although you may want to help younger children with the glue gun. 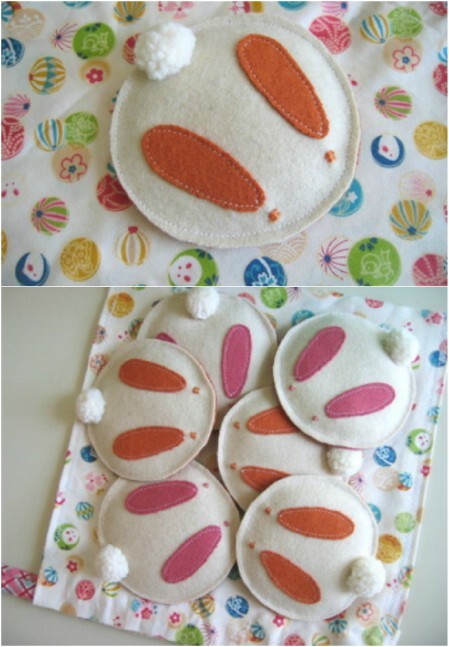 Let them help you to design their carrot and even place the buttons in the carrot shape. The project is not hard by any means and each wall art piece will only take you about 20 minutes to complete. This is a simple but very cute idea combining the shape of an egg with a bunny. 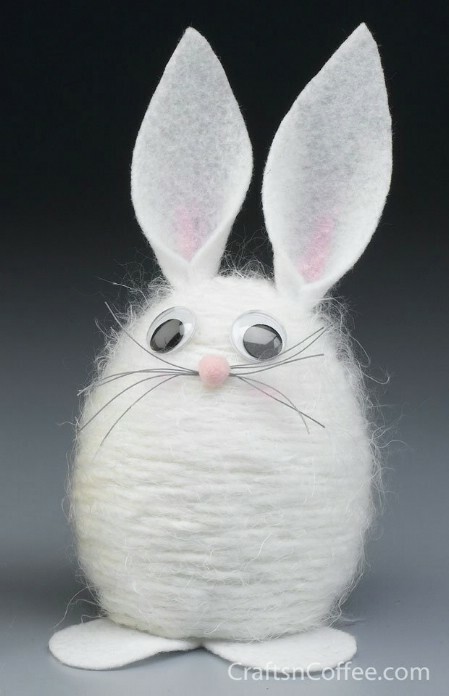 The yarn bunny can be made using a Styrofoam egg, white yarn (fuzzy yarn gives the best effect) and some other simple crafting supplies. The step-by-step tutorial will walk you through the creative process. As a bonus, the author of Crafts ‘n Coffee has also included links to 13 other fun Easter projects, all of which look like they would be a lot of fun! 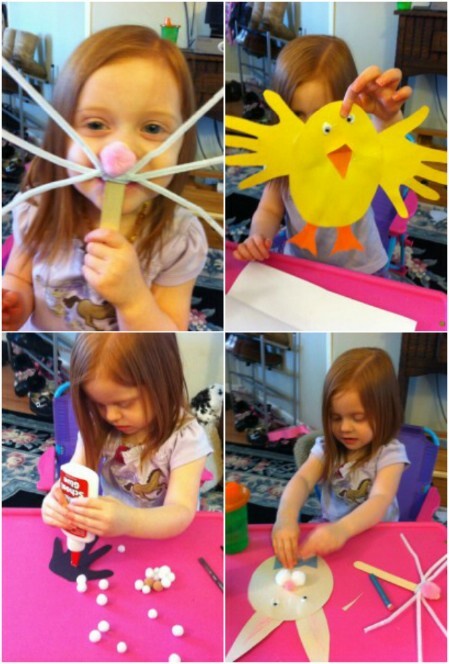 If you want to take some unforgettable photos of your kids this Easter, sit down with them to make bunny masks. Supplies are really basic; you just have to get some heavy card stock paper in white, some pink craft paper, some cotton balls, and string for the back. Elastic string works best to hold on the masks, but in a pinch, regular string will do fine. The kids will enjoy making these fluffy masks, and will love wearing them even more! You will be able to snap some adorable photos for the family album and enjoy them for years to come. Have you done a lot of DIY projects around the home? Maybe you’ve collected a lot of those paint chips from the hardware stores—the ones that show you color samples. If you have a stack of these colorful cards, you can put them to festive use this Easter by turning them into an Easter egg garland. 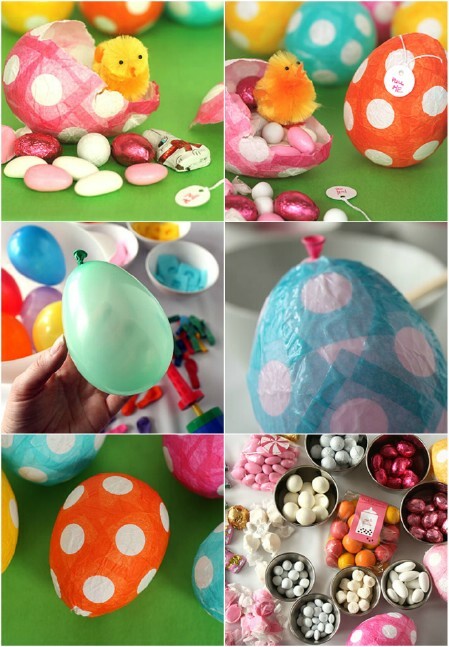 The idea is really simple; you just cut them all into Easter egg shapes, punch holes in them, and string them up. They look really fantastic! Who would think that you could up-cycle these cards in such a creative way? This project is a little more involved than most of the others here, since it requires you to roll out some salt dough, measure out its thickness, cut it into shape, and bake it. Once you have the flattened “egg” ornaments baked, you can paint them using spray paint or acrylics. Paint pens are perfect for adding more details. You can then seal in the color. The tutorial will walk you through the baking and the decorating process in-depth. You can then hang these little egg ornaments wherever you want. Here you can see them on a tree; they add a real splash of color! Okay, so not 100% edible, but most of it is! There is a smaller bowl inside the larger one, with the tulips placed inside the smaller bowl. There is water in the smaller bowl so that the tulips can thrive. Around the smaller bowl are jelly beans, edible Easter grass, and peeps. The finished result is very celebratory and just shouts springtime! 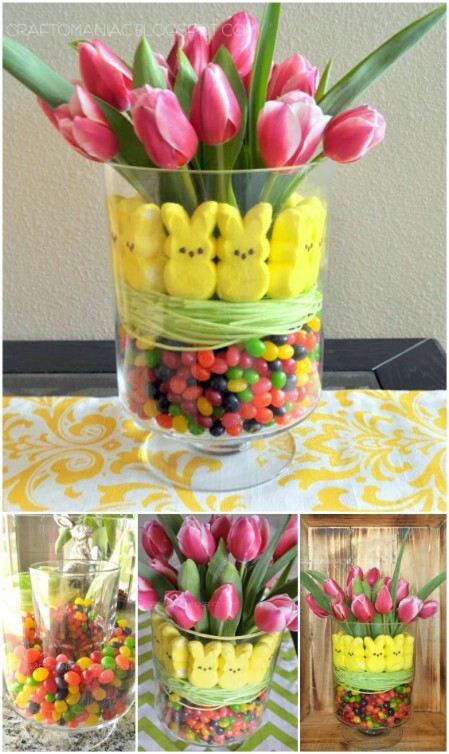 When the tulips die, you can simply replace them with new flowers, all without disturbing the candy arrangement. I love the tulips for this because they are so beautiful and immediately make you think of spring and new beginnings, but any flowers would look great! And of course, when you feel ready, you can take out the candy and eat it (don’t be surprised if your kids are constantly sneaking jelly beans out when you aren’t looking or if you suddenly find a mysterious gap between the peeps). We just love all the great ideas over at Crafty Morning! This is a great activity for introducing small children to puzzle-solving. 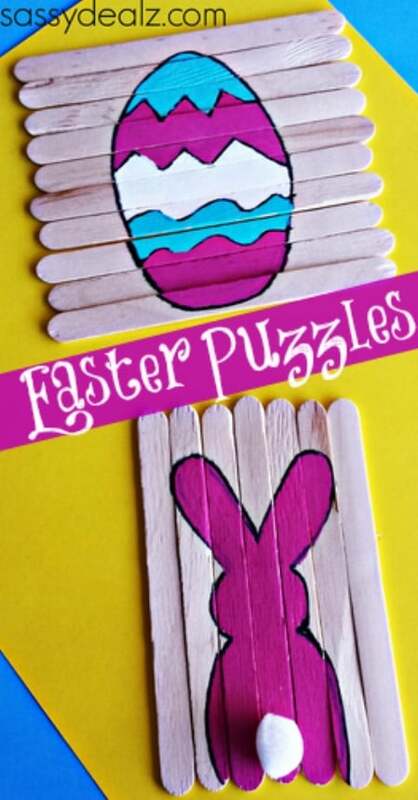 To make these puzzles, you just need to get some popsicle sticks, paints, markers, and anything else that you want to decorate the sticks with (the white pom pon used for the bunny’s tail is so cute!). Making the puzzles is as simple as temporarily taping the sticks together, painting on them, and pulling the tape back off. Kids can then mix the sticks up, and then put them back together again to reform the pictures they made. If you have more than one child, it’d be fun to let them make puzzles for each other to solve. You’ll enjoy making puzzles for your children too. Have a child who loves marshmallows? Then she will love the marshmallow Easter bunny craft. This tutorial will show you how your child can make a cute picture of an Easter bunny using marshmallows. Be sure to come up with a rule for how often your child can eat the marshmallows, or they will probably try to eat the whole bag. This is actually a great way to teach a reward system for completing work. It can also be helpful for teaching toddlers how to count. And of course, it’s a fun way to spend time together on Easter—and a pretty good excuse to eat plenty of marshmallows yourself. Daily Leisure has a number of cute crafts for toddlers. On this page, you can discover four exciting projects you can do with your child, all of which are really easy and require only minimal supplies. The first is a simple bunny mask, which consists of nothing more than a few pipe cleaners, a large craft stick, and a puff ball for the nose. The next is a hand-tracing project which can be turned into a little lamb using white puff balls. The third project uses a couple of hand cut-outs to create the wings of an Easter chick. The last project is an easy construction-paper bunny rabbit with puff balls for the muzzle and nose. Any one of these would make for a great bonding activity with your child this Easter. You can do all four for even more fun! One of the best parts of Easter is of course painting Easter eggs. 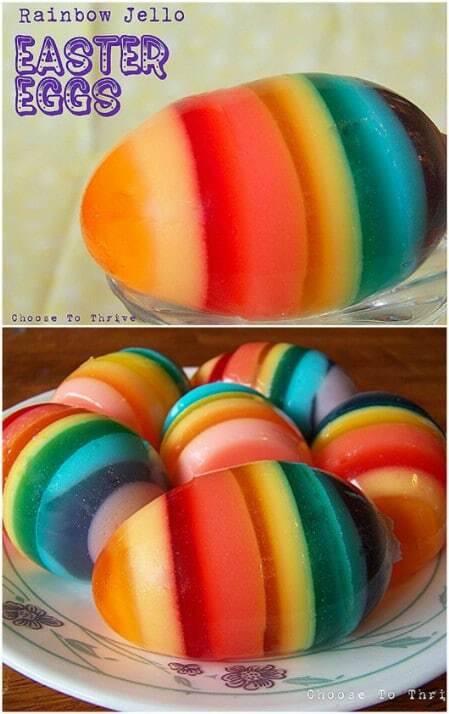 I remember when I was a kid one year, we had the most amazing Easter eggs ever, with fancy swirls of color. I wondered about them in subsequent years, but never ran into anything like them again, and for some reason didn’t think to ask. Now I think I’ve rediscovered them! These gorgeous Easter eggs are painted using a technique called nail polish marbling. To do it, you need at least several colors of nail polish; bright fun colors will obviously have the best effect. Despite how elaborate the finished results appear, the process itself is quite simple, and involves dipping the eggs in a cup with water and nail polish. Following the tutorial is effortless. The finished eggs look just incredible! I can’t imagine how many other cool things you could make using this technique. The same blogger who brought us this tutorial also made some pretty cool dishware using nail polish swirling. These are really quite remarkable! If you are looking for a culinary treat that is going to look as amazing as it tastes (maybe more amazing), look no further than these Easter bunny marshmallow pops by Lindsay Ann, winner of Food Network’s “Cupcake Wars.” They really do look like amazingly realistic little Easter bunnies, with lots of great details (just look at those feet). They are very colorful too! Check out the tutorial for a full list of ingredients and a step-by-step walkthrough of the recipe, complete with pictures. You’ll not only learn how to turn marshmallows into a bunny, but even give him a little gummy carrot to hold. If you are planning on doing this activity with your children, it would probably be best for older children who can focus and do more precise work. It would likely be too difficult for younger children. Make sure you scroll down to the bottom of the page for other exciting Easter treats, including little Easter baskets on sticks, or amazing little Easter sheep on sticks! There is also a cupcake with little birds looking out of it, shaped like a nest. All of them look remarkably detailed and beautifully made. Seriously, this is one creative lady! 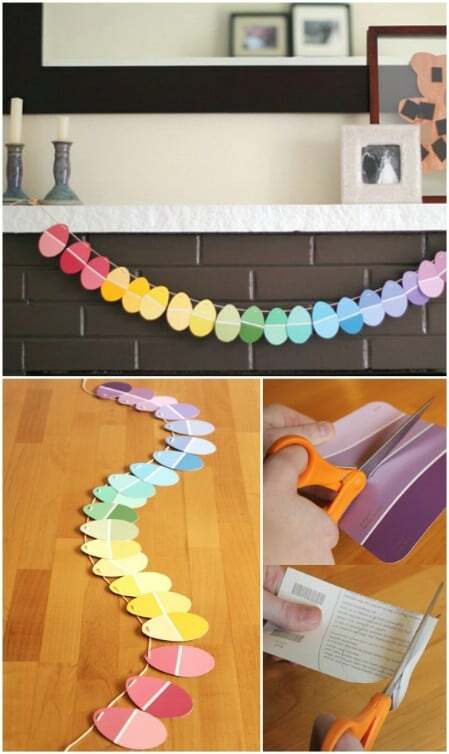 This is a quick and easy decoration using cheap, readily available materials. 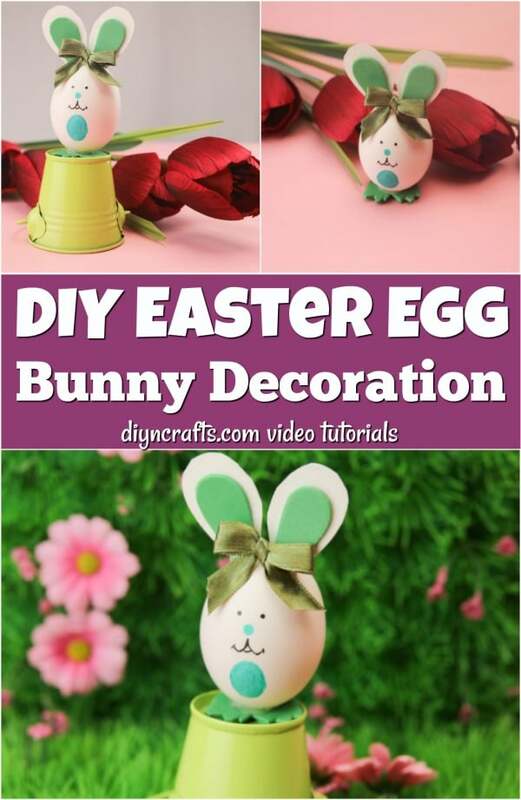 Do this activity with small children, and you’ll soon have lots of adorable little bunnies decorating your house for Easter. Have colored tissue paper and some drab windows that could use a little color? 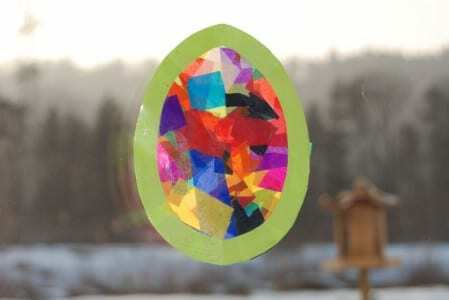 The tissue paper Easter egg collage has a beautiful effect almost reminiscent of stained glass. You need very few supplies for this—just tissue paper, sticky backed paper, colored card stock, and scissors. It only takes a few minutes to make a single egg, and many toddlers could stay busy with this for quite a while. It isn’t a messy activity, and clean up is really quick. This makes it a wonderful choice for toddlers. 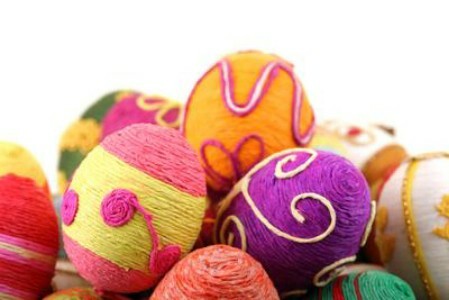 If you are looking for something a little different this year for decorating your Easter eggs, look no further than this string-decorated egg project. You want to start by blowing out the eggs so that you can preserve them. You can then pick up some colored string (or dye it yourself), embroidery thread, or wool. 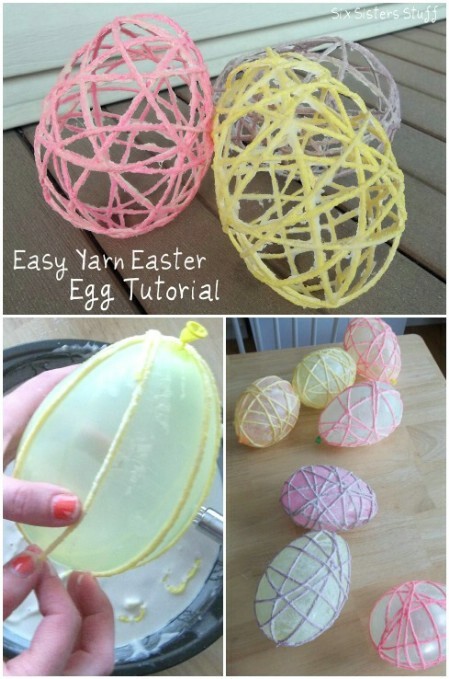 You can wind them around the egg and glue them down, making designs. They make a beautiful centerpiece for your table over the springtime, and best of all, you can save them! Years later, it is a lot of fun to bring out the old eggs and look back at them to see how your children’s artistic skills have evolved. These make wonderful keepsakes of childhood. This is also a creative activity which grown-ups can thoroughly enjoy. Looking at this Easter egg, the Jello texture is so convincingly egg-like that for a moment I thought when I first saw it that it was an actual egg, somehow amazingly dyed with rainbow colors. To make this, you will have to buy the egg-shaped molds for your Jello, and then carefully layer the colors according to the instructions. This can be a little tricky, but the instructions will help you to avoid pitfalls. So long as you follow the tutorial carefully, you should be able to do this fun cooking activity with your little ones. They take some time to set, so be ready for a lot of impatient children asking, “Are they done yet?” The results are definitely worth it. These would make an excellent treat for an Easter celebration. 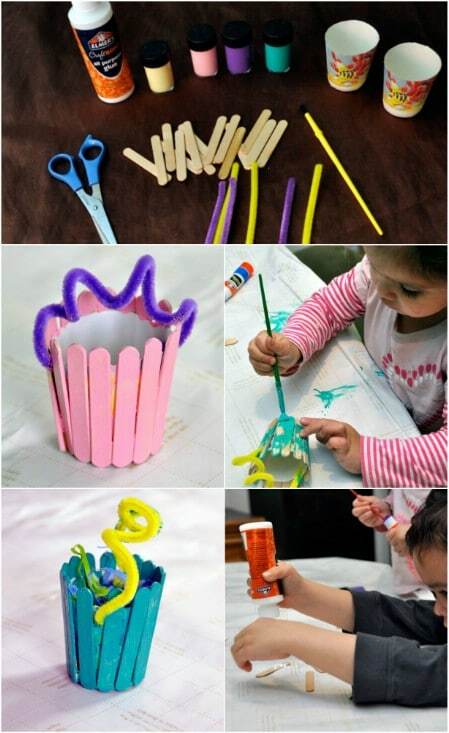 Here is another craft you can make using paper cups. This time, however, you will not place the cups upside-down to make your cute critters; instead, you will keep them upright. That way they can be filled with Easter grass and treats. Both are simple and require only a few supplies, and they will be great, quick projects for little children with short attention spans. They look sweet, and they hold sweets. You can’t ask for more than that for an Easter craft! In design, these remind me a bit of the bunny bean bags from before. While the finished design looks a lot different, it’s a similarly simple sewing project. They’re made out of felt, embroidery floss, and tapestry yarn. There is a printout template available, or you can just copy the profile of the bunnies by eye. It’s a very simple matter of sewing the edges together and adding the little poofy tail and the whiskers. You could make these in any color you want and they’d look adorable. 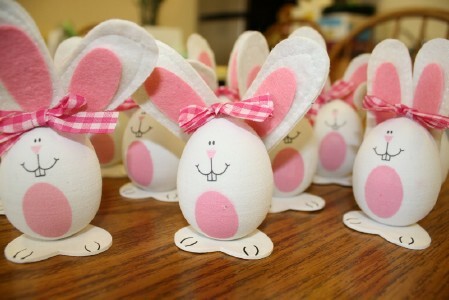 Your kids will have a very enjoyable time playing with them and telling little Easter stories with their imaginations. You could make them yourself, or if you have older children who can safely use an embroidery needle, they can join in the crafty fun. This idea comes from an assisted living center, and sadly there are no instructions included, but it looks to be a simple craft to duplicate just by looking at the photo. You need the eggs, felt for the ears in pink and white, little bows, what looks like card stock for the feet, and a pen and egg dye for the bunny faces and bodies. The finished results are very cute! 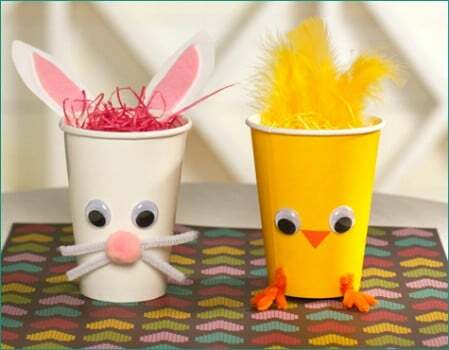 This is also a great reminder that Easter crafts aren’t just for kids; they are fun for everyone! While the finished results of this project look quite spectacular, it is a relatively simple project. On the site, you will find a printable template. Simply print it out, cut out the little outfits, and use tape or glue to wrap them around. From there, it is just a simple matter of drawing little faces on the eggs and putting them inside their outfits. This would be a perfect activity to do with small children. If you have more creative children who might like to make their own outfits, you can do that too! 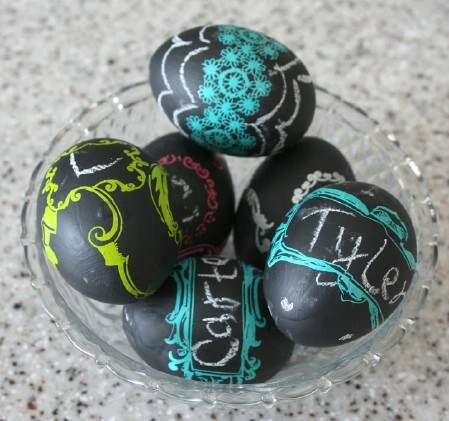 This is an easy and creative activity to do before an Easter hunt. Simply get some gift bags and scrapbook paper. You can use the paper to create ears and feet and noses—and of course you will want pipe cleaners for the whiskers. The bags are very cute and fun for kids to make and search for later. They could also be used as gift bags if your kids like to exchange Easter candy at school with their friends. Even really small toddlers will have fun with this activity! Here is another culinary activity you can do with your kids! 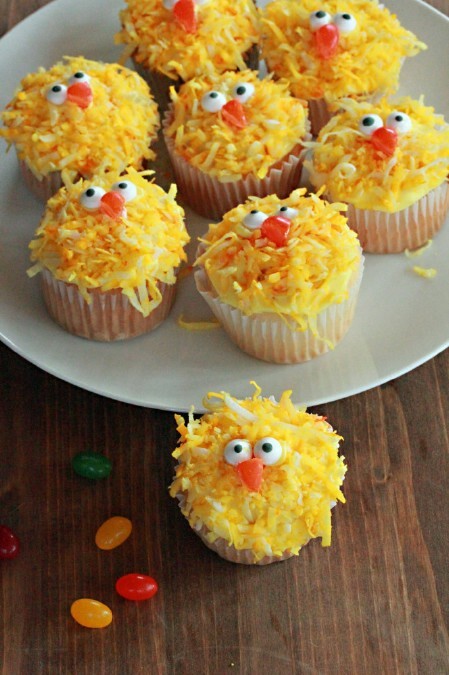 These Easter chick cupcakes are just adorable. You can make any recipe you want for the cupcakes; the important part is what goes on top You will need yellow frosting, and for the top, you can use coconut dyed yellow with food coloring for the “feathers.” What about your chick’s eyes? You can buy little candy eyeballs which are perfect just for projects like this. The beak is just a jelly bean cut into a triangle shape; a gumdrop works as well. If you left the coconut white, you could try making sheep cupcakes too. You’d just need to substitute a different color jelly bean for the nose. While there are a lot of paper plate crafts on this list, I can’t resist adding one more. These paper plate critters are so cute! 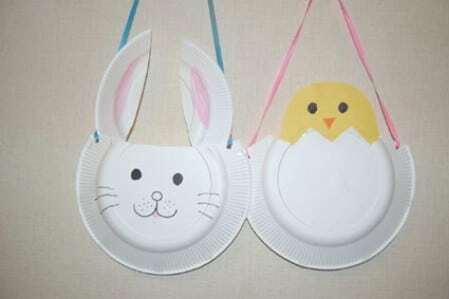 The bunny is similar to one of the paper plate bunnies I talked about earlier, but the chick is different from any other Easter plate crafts I have seen yet. It looks so cute poking its head out of the “broken egg” formed by the plate! I also like the addition of the string for hanging these up. They would be perfect to hang from a doorknob or off of a bulletin board. Since spring is the time for renewal and growth, it makes sense to have at least one plant-related craft on this list! This is both a craft lesson and a gardening lesson for children. To do it, you start by breaking the top off an egg and pouring the egg out, and then painting the egg and drawing a face on it. 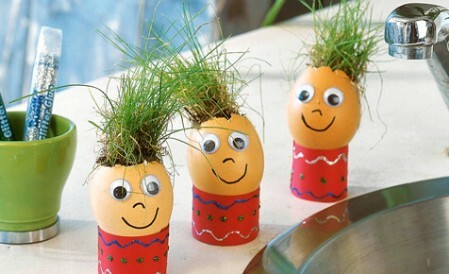 You can then plant grass inside the eggs and watch them grow a full head of “hair.” You could also try this project with other small herbs. While this project was originally recommended for elementary school students, it would be a great one to do at home too. 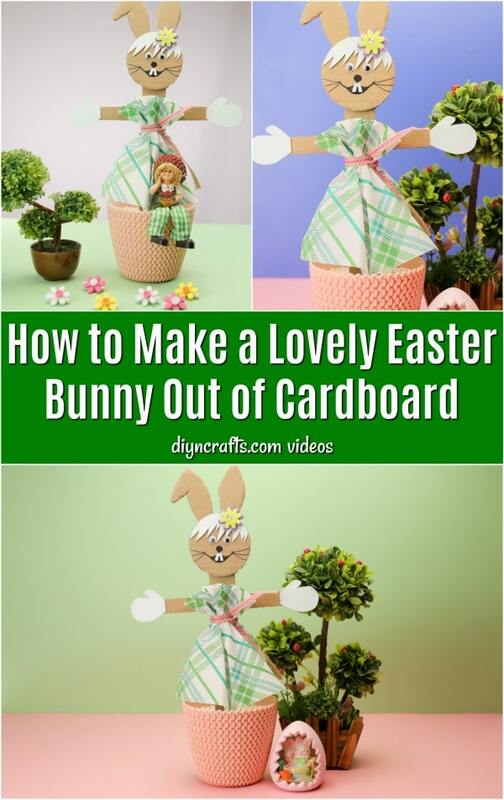 If you have an empty milk carton and a few other basic supplies, this is a cool craft for creating a basket shaped like a bunny. This project looks to have a few more steps and a little more complexity than some of the others on the list, so this one may be best suited to older children. You may need to hit “translate” on the tutorial, but the photos are easy to follow. The finished result looks amazing! Looking at those bunnies, you’d hardly believe they ever started their lives as milk cartons. We love chalkboard paint. 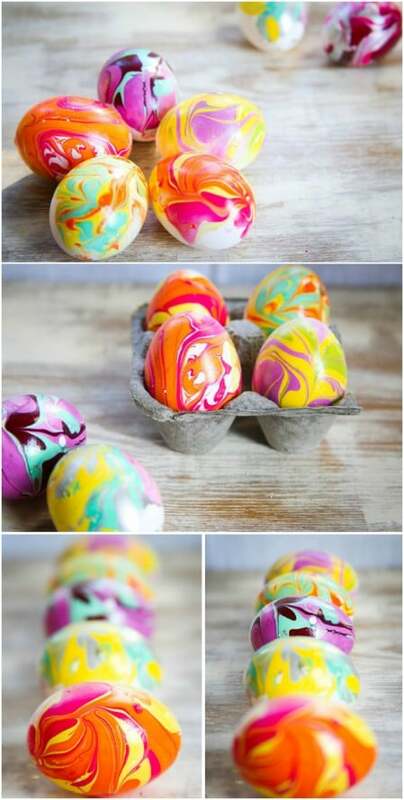 There is nothing you can’t do with it, including decorate Easter eggs! Personally, I wish this had been around during my own childhood. There’s only so much you can do with traditional Easter egg dye. With chalkboard paint, children’s imaginations are unlimited. They can draw designs that are as simple or intricate as they want. This activity is great for toddlers, older children, teenagers and adults. Chalkboard paint is awesome!